Flora loves drawing maps and uses them to tell us about her life! Mapping My Day introduces spatial relationships and representation: where things and places are in relation to other things. 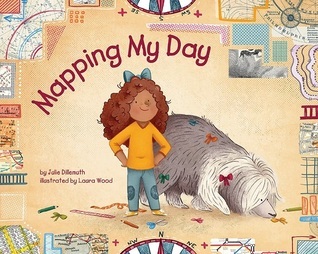 This book intends to show readers how maps can convey information, inspire children to draw their own maps, and introduce basic map concepts and vocabulary. Spatial thinking is how we use concepts of space for problem solving and is shown to be a key skill in science, technology, engineering, and math. Includes a "Note to Parents and Caregivers" with extra mapping activities. 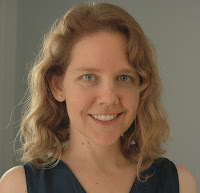 Julie Dillemuth was mystified by maps until she figured out how to read them and make them, and it was a particularly difficult map that inspired her to become a spatial cognition geographer. She lives with her family and writes children's books in Santa Barbara, California, where the west coast faces south. Visit her at her website: http://juliedillemuth.com. Flora loves to draw maps. It all started the day she buried her treasures in her yard to hide them from her little brother and had to draw a map to find them again. Flora introduces us to a day in her life. Each part of her day includes a map. There's a map of her house, her backyard, the way to school, the playground, and her aunt's dog obstacle course. It was fun to read about Flora's day and then see it diagrammed on the map. Each map also introduces one important aspect of maps such as a compass rose, a scale, and landmarks. At the end, the author has included suggestions for a bunch of activities that parents or teachers can do with children to help them learn about maps. This is a fun way to introduce children to the concepts related to spatial relationships as well as a great starting point for learning to use and create maps. In graduate school for geography, I was fascinated with research about the ages at which children can understand spatial concepts like maps or imagining things from another perspective. And I also learned that we don’t really teach kids about spatial thinking like we teach them reading and math. Of course, some parents and teachers do — they are really into maps, puzzles, and other spatial activities. But there’s a big variation in kids’ exposure to spatial concepts. About seven years ago, kinda out of the blue, I had an idea for a story for babies that was full of prepositions and other positional language, and it occurred to me that fun, engaging books with spatial thinking themes could help promote these skills. I thought of more story ideas, and then realized I’d better figure out how to write for kids! I joined the immensely supportive Society for Children’s Book Writers and Illustrators (SCBWI), and began going to workshops and taking writing courses. The more I got into it, the more I loved writing picture books, and I knew I wanted to make it my career. I’m encouraged that so many people recognize the value of teaching spatial thinking skills to kids, and I’m happy that I can use my expertise in such a unique way. *What do you enjoy most about maps and mapping? My first real interest in maps and mapping was as an archaeology major in college. Before that, on road trips when I was little the road atlas was always within reach, but I didn’t pay much attention. In college we mapped our archaeological site with a plane table and alidade (really old school!) as well as with more modern surveying instruments. And I did projects combining historical maps with satellite imagery, which was really exciting. I love old maps of places I know—it’s neat to see what’s different now. But USING maps to get around was a completely different story. I have a terrible sense of direction, and I used to hate trying to find my way with maps. Without fail I would get lost, and that’s an awful feeling. But that’s actually what led me to study spatial cognition and how people use maps—I wanted to know why I got lost and disoriented so easily, and why I found maps so frustrating. To my surprise, in the course of researching maps and how people interact with them, I got so much better at using maps myself and staying oriented! Now I look forward to exploring new cities, I know how to prepare for a new trip before I get in the car, and I’m confident in using maps. I think what I appreciate most about maps (and of course there are so many kinds of maps), is that they show you a bigger area than you can see from where you’re standing. And that’s a pretty powerful perspective. *What does a spatial cognition geographer do? What’s great about geography (as you know, being a geography major!) is that it’s anything that has to do with the interaction of people and the earth. Geography is everywhere! Cognitive geography is an intersection of psychology and geography (and other disciplines), concerned with how people think, learn, and problem solve with regard to physical or virtual space. So spatial cognition topics include things like finding your way, using maps, spatial abilities, how we talk about space with language, architectural design, virtual and augmented reality, visualizing things that are to too small, too large, or too hidden to see, reading diagrams, and the list goes on. There’s a lot of opportunity for research in these areas, since there’s so much about the mind that we still don’t know or fully understand. The more we discover about spatial cognition, the more we can apply that knowledge to designing things more effectively, whether it’s a navigation system, a building, a virtual environment, etc.—and the better we can teach spatial skills and improve our spatial abilities. One lucky winner will receive a copy of MAPPING MY DAY (U.S. addresses).